The Moulin de la Galette in Montmartre, named after one of the three windmills in the neighborhood, held open-air dances every Sunday, and these would start in the early afternoon and carry on until midnight. It provided Renoir with the subject for this, his most ambitious work of the period. From the lengthy account of the picture given by Renoir's friend Georges Riviere, many of the models for the figures can be identified (though not always their positions). The three men seated at the right are Riviere himself and the painters Pierre Franc-Lamy and Norbert Goeneutte. Next to them are one of Renoir's models and her sister, while to the left the two most prominent dancers are another of Renoir's models, Margot, and the Cuban painter Pedro Vidal de Solares y Cardenas. Several of the other dancers were also friends of Renoir. Riviere noted that the women in this work, whom the artist had patiently coaxed into posing for him, were of working class origin, i.e. of the type that would normally frequent such dances (Montmartre was a poor, fairly rundown area). Caillebotte bought the painting, probably on the occasion of its exhibition, from where it entered the State collection with his bequest. L ater Renoir described how his friends had helped him to carry the canvas to and from the dances and, though it was partially painted on the spot (as emphasized by Riviere), Renoir also made various preliminary studies. The framing of the scene, in which the figures at the sides are cut off, gives the impression that it continues beyond its bounds and that this is thus a slice of reality. The light brushwork is an extension of that used by Renoir in his smaller works, and, in particular, he has captured the mottled effects caused by the light filtering through the trees. For example, the back of the man in the foreground and of the dress of the woman seated next to him are marked by spots of coloured light, while the ground by Margot and Solares y Cardenas is fragmented into areas of pink and blue. These unusual features were criticized by some in the reviews of the Third Impressionist Exhibition of 1877 at which it was displayed. Both Riviere and Renoir admired the way in which the young workers who attended these dances managed to put aside their cares for its duration, and Riviere was keen to present the painting as a genuine scene of Parisian life. 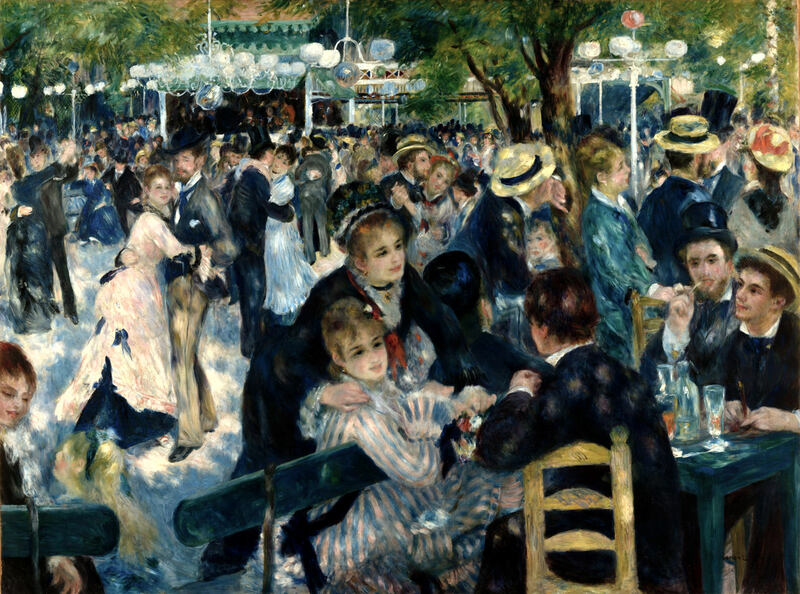 However, the very description he gave of the figures shows this to be somewhat untrue: the work is in many ways contrived and largely populated by Renoir's middle-class friends, who are enjoying the company of the lower-class girls - the image of carefree enjoyment is essentially an ideal.